Michelle Knapp of Peekskill, New York State once drove a 1980 Chevrolet Malibu. At 8.00 pm on 9 October 1992 she was dismayed to hear the crunch of buckling metal from her driveway. Her first automobile had been struck by a 12 kg meteorite ( Figure 10.1). For hours beforehand thousands had watched a greenish-white fireball moving from above Kentucky 1000 km away at about 260 km h-1 towards New York . Michelle’s curious insurance claim, and the leap in the resale value of her Chevy stemmed from a fragment of a rock that had previously moved in an orbit from just beyond Mars to close by the Sun. Apart from the unusually low angle of its entry into the atmosphere, the Peekskill meteorite was unexceptional. Michelle was lucky in two respects. Meteorites move in space at speeds around 75 000 km h-1. Had this one not been slowed by friction during its long passage through the atmosphere the Chevy, the house and Michelle inside it would have been vaporised. While ‘shooting stars’ offer a ready ruse for romantic encounters on warm, clear, moonless nights, being struck by one or finding a steaming object in the shrubbery are rare events indeed. Rare, that is, by an insurance actuary’s yardstick, the human lifetime. As we have seen, geological time is 650 million times longer than three score years and ten. That the Earth has experienced direct hits by projectiles wandering through the Solar System is witnessed by the celebrated Barringer Crater in Arizona, dated at 20 000 years ago, and by a few much larger ringed basins scattered across the modern continents (Figure 10.4). It stands to reason that the larger an exotic impact the less likely it is to happen. But given time, as geologist Ken Hsu once put it, the Earth obeys the law of ‘the inevitability of the highly improbable’. Our interest lies not so much in rarity, but in severity, and that means the rate of energy release or the power of such events. In March 1989 an asteroid half a kilometre across passed within 0.5 x 106 km of the Earth. Its speed was 20 km s-1. Making some assumptions about its density, it is simple to calculate the kinetic energy of this near miss. It is given by half its mass times its velocity squared, around 4 x 1019 J. Had the asteroid struck the Earth all this energy would have been delivered in a variety of forms to the Earth System. Since the bulk of the atmosphere is about 20 km thick all of the energy would be delivered in around one second. So the power of such an asteroid’s impact would amount to 4 x 1019 W.
Thinking in terms of 1 kW electric kettles is just not good enough. Such an impact would deliver more than a million times the annual power of all human energy use (1.3 x 1013 W) and the Earth’s internal heat production (1.7 x 1013W), a hundred times annual solar heating (1.5 x 1017W) and about half the power of detonating every thermonuclear device ever assembled (8 x 1019W). For about a second, what Eugene Shoemaker called a ‘small hill falling out of the sky’ would overwhelm the power that makes the Earth System and human society work. Its magnitude compares only with a full-on nuclear Armageddon. Using information about the earth-shifting capacities of underground nuclear tests makes it possible to scale up estimates for the power involved in impact structures that we can observe. 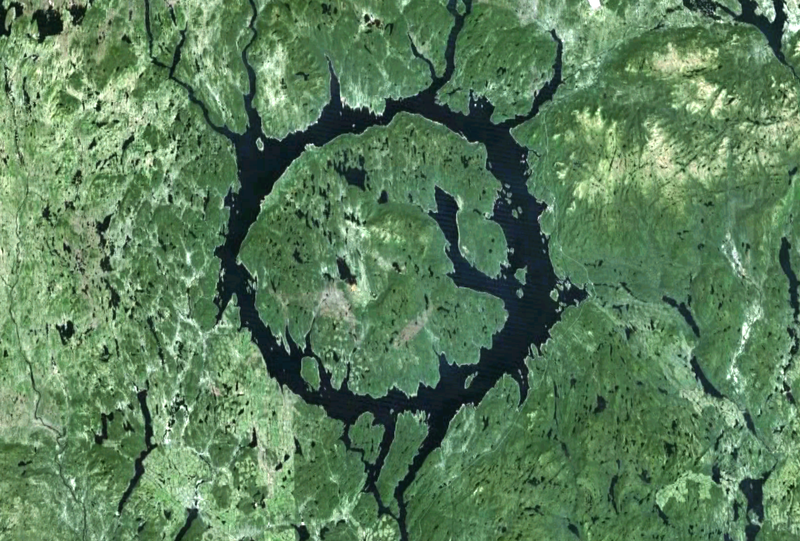 One about 65 km across now encircled by Manicouagan Lake in Quebec, Canada (Figure 7.5) involved more than a thousand times the power of the world’s nuclear arsenal; equivalent to about 46 million megatonnes of TNT. Unlikely as they might be, direct encounters with extraterrestrial objects are by far the most powerful events in the Earth System. Apart from a few people like Michelle Knapp, we have no direct experience of the risk from such impacts, indeed most of us are much happier to forget it altogether. But sometimes we can not. In July 1994 the planet Jupiter was struck by 21 fragments of the small comet Shoemaker-Levy 9, which had broken up under Jupiter’s gravitational influence during a previous orbit. Astronomers watched in awe as the fragments created scars up to the size of the Earth itself in Jupiter’s dense atmosphere. Within a week the US Congress directed NASA and the US Department of Defense to identify within 10 years all comets and asteroids that might pass close by or collide with the Earth. Such a sky watch is a sensible and not-too-costly precaution. Knocking small, wandering hills off course is well within our technical capabilities, and so most people can rest safe in their beds. The same cannot be said for Earth scientists. All of us had drummed into our heads that how the Earth behaves today is the key to understanding its entire history. Since Lyell’s day and until about 1980, most geologists’ watchwords had been ‘gradual’ and ‘uniform’. The issue of sudden and unpredictable extraterrestrial impacts therefore takes on a philosophical mantle, as well as opening a fascinating window on past events. Because of their power impacts cannot be ignored. The Earth works through perpetual internal and solar heating, and what it might inflict on itself has limits imposed by that power supply. Continual energy supplies determine the rates at which most things happen; plate movements, the circulation of air and water, the production of magma and the release of gases locked in the mantle, and even the pace of biological evolution. Power also carries the connotation of scale. And what of the way in which work is done? We can grasp the processes of the ‘steady state’, seeing their limits, but impacts deliver in seconds vastly more power than that involved in day-to-day, Ma-by-Ma processes, and the power is delivered to tiny points not whole worlds. This is the stuff of true catastrophe that force a rethink of the predictability and orderliness that were the philosophical goals of the founders of Earth science. Any development in geologists’ philosophy must allow that the Earth System is set in a context far wider than the confines of the home planet. We saw earlier that the weight of evidence tips the scales towards the formation of the Moon from the Earth through a titanic collision. That happened shortly after the Earth had accreted from the pre-solar nebula. The Earth was shaken and stirred, but probably remained as an intact body. It may well have had a briefly molten veneer, but clung to a considerable proportion of its original share of volatiles. Earth’s remaining complement of water makes it a lively offspring of the pre-solar nebula. The Moon is far drier and devoid of any significant geological life of its own, for which the best explanation is that it was born in a firestorm. The lunar surface expresses all of its 4.47 Ga history, pocked by craters of every size, and sealed over by basaltic scar tissue from the worst of its injuries. Since it has been our world’s companion from the moment of its birth, the Moon’s surface also records the Earth’s exposure to the wider cosmos. However, Earth is bigger, more massive and so must tend to pull in even more projectiles than does the Moon. In fact, it has more than 13 times the amount of interaction with passing debris. Being almost as old as the Moon itself, the light-coloured lunar Highlands are more devastated than a road sign in deer-hunting country. Every part of the lunar Highlands shows crater overlaid on crater (Figure 10.2a). Despite the radiometric dating that followed the Apollo mission, it is difficult to unravel a sequence of events in the Highlands over any sensible time span. But the lunar surface is not all primordial crust. The Man in the Moon’s features are picked out by dark scar tissue with a much smoother surface. The first Apollo landing was directed to one of these surfaces. The maria do have craters, but they are few and far between (Figure 10.2b). The boundary between Highlands and maria is sharp; the pock-marked ancient crust gives way abruptly to the smoother cheeks of a more youthful phase of lunar history. So, how young are the maria, and what are they? The Apollo mare samples are similar to the Earth’s volcanic basalts, except for being drier and enriched in K, REE and P. Dating shows them to cover a long time span, from 4.1 to 3.2 billion years ago. Figure 10.2 Lunar surfaces: (a) repeated cratering in the lunar Highlands; (b) the southern border between Mare Crisium and the Highlands. The lunar impact history divides into two broad phases: one from 4.4 to 3.8 Ga that was so intense that every square metre of the Highlands was shattered; a later episode since 3.8 Ga that records much less intense bombardment over a six-times longer period. The maria lavas represent an attempt at repaving the Moon; a one-off, incomplete job. Melting dry rocks needs much more energy than for the damper rocks of the Earth’s mantle, and the Moon has a much lower complement of nuclear fuel. Examining the outlines of the great mare basins provides a clue to the power source. They are clearly curved in places. It needed a rear-side view of the Moon to truly resolve the maria problem. There, the Orientale basin (Figure 10.3a), the biggest bullseye in the Solar System, has dark flat mare basalt at its centre surrounded by older, more-cratered highlands. At almost 1000 km across, Orientale is the scar of a colossal impact. The ringed structures are thought to have formed when a huge unstable edifice collapsed along a series of mantle-tapping faults after the impact had ‘excavated’ about 3 million km3 of the Moon’s crust and flung it out radially. A smaller crater, Tycho (Figure 10.3b), shows such sharp topography that it is reckoned to have formed by one of the youngest large lunar impacts, dated at 108 Ma. Its central peak indicates a sort of rebound, while details of its walls show extensive gravitational collapse along faults. Figure 10.3 (a) Orientale basin on the far -side of the Moon. Note the dark, smooth terrain at the centre, which is mare basalt (b) The crater Tycho, almost 90 km across. The maria are the sites of the largest impacts that the Moon received, filled with lava that heat from the collisions generated in its mantle. The clues to the age of these basin-forming impacts come from debris that coats the Highlands, which includes glasses that often cement together blocks of highly shocked crust. The most common ages of the Highland glasses lie between 4.0 and 3.8 Ga, a period within the age span of the maria-forming impacts. Using simple statistics we would expect the time between impacts to increase with the size of the projectiles and their craters, and for times to be evenly spaced, probably lengthening as the Earth and Moon gravitationally swept debris from their orbits. Oddly, the biggest collisions were neither early nor widely spaced in time, but occurred a half-billion years after Year Zero. The mare-forming period was not some grand finale to an early process in the young and untidy solar system. The mare plains are cratered too, by sharp and spectacular features. Some of these post-maria craters are big (Figure 10.3b). Later impacts excavated material from beneath the dark basalts flinging it radially outwards to form light coloured rays. Patient analysis of photographs that show how craters lie on older craters and rays, and how some structures retain sharper outlines than others, together with dates of glass spherules in the dusty soils of the maria, give a post-maria impact history. Not only does the post-maria record span the entire history of the Earth’s rocks and fossils, but the bombardment rate stayed roughly constant over that time. The objects that caused the cratering must somehow have been continually replenished, because an initially fixed number of objects in orbits that would encounter the Moon should have steadily declined as a result of gravitational sweeping. You can view an animation of the Moon’s cratering history here. The Earth could not have escaped bombardment, and nor can it now. Statistics can be fascinating, when they are based on hard fact. For the Earth the facts about impacts are few and far between. Figure 10.4 shows all the known terrestrial impact craters; only 131 from the smallest to the largest. There are very few older than 600 million years, and most formed in the last 50 million. Nor are they evenly distributed, clusters occurring where there has been most surveying by geologists. Mountain ranges, deep sedimentary basins, rain forests and icy areas show few, and of course 70 percent of the Earth, the oceans, show hardly any, although oil exploration has revealed hints of three large, offshore craters. There have been terrestrial strikes, but only the young and the large are represented. This is because the Earth is so geologically active. Nowhere on the ocean floors is older than 170 million years, and any craters there eventually are sucked into the mantle at subduction zones. Mountain building breaks up neat outlines on land and exposes craters to the forces of erosion that smooths, fills and finally buries them. Empirical scientists, particularly those still under Lyell’s influence and comforted by his gradualism, might cry ‘Just gimme the facts’; and there are few. Those conscious of both the deep uncertainty about the Earth’s distant past and its astronomical context argue with equal force that only the tendency of water to flow downhill is more certain than small hills occasionally falling out of the sky. Such a conviction emerges from the statistics of the lunar cratering record. 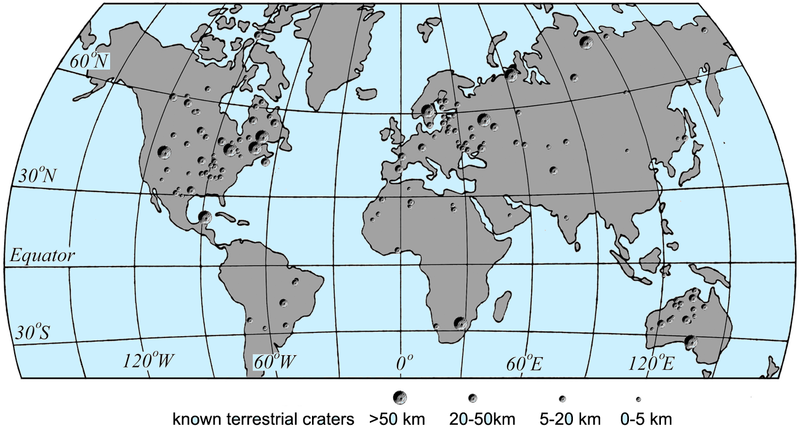 Figure 10.4 Location of known impact craters on the Earth. Patient counting of craters according to size range for different sectors of the lunar surface shows up a simple relationship that holds everywhere on the Moon and also on other cratered but otherwise dead planets. The number of craters is inversely proportional to the square of their diameter (Figure 10.5a). The Earth’s larger gravity and size mean that 13.4 times more craters in each size range probably formed over the same period. This gives us the ‘ready-reckoner’ in Figure 10.5b. On the Moon there has only been one crater larger than 1000 km across, 250 larger than 100 km and so on. The curve for the Earth is simply that for the Moon shifted upwards by 13.4 times. It implies about 27 larger than 1000 km and over 3000 more than 100 km across. The Earth may have experienced one crater around 5000 km in diameter; large enough to span the Atlantic or engulf the whole of North America. Figure 10.5 (a) Cumulative size-frequency plots (total number of craters ≥ a particular diameter) for lunar and estimated terrestrial cratering . The scales for both axes show powers of ten. 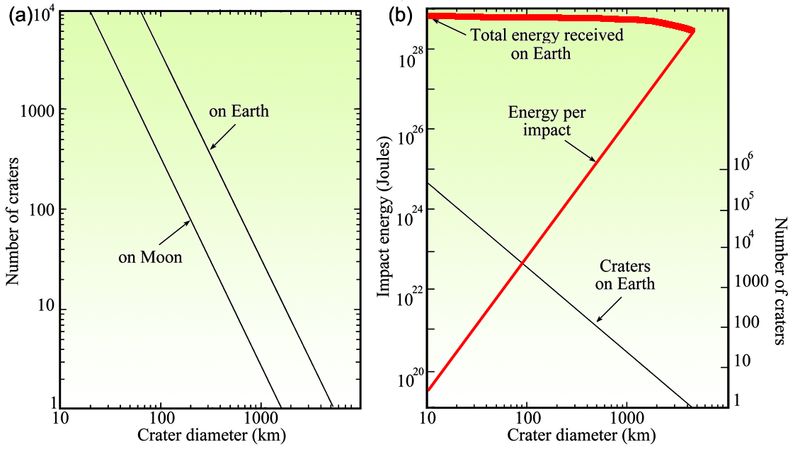 (b) Plots of energy for single impacts on Earth (thin red line), and for the cumulative effects of craters ≥ a particular diameter (thick red line). Underground nuclear tests provide another, somewhat more complicated rule of thumb for assessing the energies involved in excavating craters of different sizes. This is plotted with the Earth’s size-number look-up graph on Figure 10.5b. The biggest possible crater would have involved 3 x 1028 J, equivalent to a thousand years’ worth of solar energy delivered in a second. There have probably been about 800 impacts on Earth that delivered the equivalent of a year’s solar energy in one second; those larger than 200 km. Intense bombardment of the Moon and the Earth took place during the first half billion years after Year Zero, rising to a crescendo in its later stages. Formation of the mare basins brought it to a sudden close at 3.8 Ga, which coincides with the earliest evidence for life on Earth. The lunar evidence indicates that this Late Heavy Bombardment spanned 4.1 to 3.8 Ga. The record preserved on the lunar mare surfaces hints at many more terrestrial impacts in the period during which life subsequently evolved, even though tangible signs of the majority have long vanished. However, in 3.4 Ga old sedimentary rocks of NE South Africa there are several beds of impact-related glassy spherules, which is as old as the terrestrial impact record gets. Suitably scaled up for the Earth, the lunar record reveals the powers that might have been unleashed during life’s existence. There were probably 45 impacts spread over the last 3.8 Ga capable of producing craters larger than 200 km and yielding the equivalent of more than a year’s sunshine in a second; about one every 85 million years on average. Powers amounting to instantaneous delivery of the entire nuclear arsenal (craters larger than 15 km diameter) are much more common. A grand total of about ten thousand suggests an average ‘waiting time’ of about 400 thousand years. Suddenly, the unimaginable takes on a chilling perspective; anatomically modern humans have been around for about half this length of time and earlier hominin species back to 6.0 Ma ago may have experienced 15 such events. The actuary’s task in assessing insurance premiums to cover death by astronomical misadventure is not easy, but has been compared with that for other forms of random, violent death. Unlike murders or auto wrecks, impacts would involve many individuals; they are rare, high-consequence events. The risk of death by comet ranges from less likely than firearms accidents to more likely than food poisoning. The risk is high because many would die from even relatively small impacts. No company has calculated a premium, partly because at the upper end of the power scale there would be no one around to make a claim! The power of impacts speaks volumes, but what kind of work can they do? A mixture of observations on lunar and terrestrial craters, modelling of nuclear detonations, simple logic and not-so-simple principles of physics can give us a working idea of the possibilities. Herr Rudolf Christian Karl Diesel, a German resident of Paris, was an habitual cigar smoker and was pleased to find a new type of cigar lighter in his local tobacconist’s shop. It comprised a cylinder machined to high precision into which a piston with a cotton wad on the end fitted snugly. A sharp tap of the piston ignited the wad. You feel such adiabatic heating when you inflate a bicycle tyre. Being also a physicist and engineer, Diesel developed his piece of serendipity into the engine that bears his name. Asteroids and comets travel at speeds up to 200 time that of sound in air. By definition, their hypersonic entry into the atmosphere makes it impossible for air to be moved aside to allow their passage. They act as huge pistons compressing air beneath them, so you will appreciate the diesel analogy, but perhaps not the outcome. About 2 percent of the kinetic energy is estimated to go towards heating the compressed air. For an object larger than a few hundred metres air temperature will rise to the order of 60 000 K, ten times hotter than the Sun’s surface. This entry flash would emit hard gamma rays from horizon to horizon. Air molecules would be destroyed, their component atoms stripped of electrons to form plasma. High-energy, low-frequency radio waves would pass unhindered through the entire planet, as do those generated by with lightning bolts, perhaps to interfere with electrical activity in the fluid outer core that generates the Earth’s magnetic field. Huge pressure gradients in the air eventually force a blast effect. As well as sideways blast, models suggest an upward one at velocities that approach those where matter can escape the Earth’s gravitational field (~11.2 km s-1). The synthesis of unusual gas molecules as the atmosphere cools is a distinct possibility. Nitrogen and oxygen can combine to form a variety of N-O gases, all of which dissolve in water, eventually to form nitric acid. A second after atmospheric entry, the projectile will strike either the land or ocean surface, unless it first explodes in mid-air. One explanation for the curious explosion above the remote part of Siberia near the Tunguska River in 1905, which downed forests over a large area, is that it was the air burst of an inbound small comet. Most knowledge of impacts comes from craters in solid rock on the Moon and Earth and the debris blankets that surround them. At the instant of collision shock waves of intense compression travel into both the Earth and the solid projectile, producing pressures equivalent to those deep within the mantle. The compressions travel downwards and outwards into the Earth, like an inflating balloon, and also upwards into the impacting mass, slowing it as they pass through. Energy of motion is transformed mainly to heat by compression, but the rock cannot yet melt because of the immense pressures. The outer rim of the contact is at atmospheric pressure, so rarefaction shock waves emanate from there. Since they travel into dense, compressed material they move faster, and catch up with the compressive waves and decompress the heated rock. It liquefies and even vapourises to travel along the pressure gradient towards the impact rim. There it squirts out as a radial spray of vapour, liquid and smashed rock to form an ejecta curtain of hypersonic debris rushing upwards and outwards. Some may even reach orbit, perhaps to escape the Earth’s gravity field. A few rare meteorites have strange compositions that lead us to infer that long-off impacts on Mars and Venus have hurled them here. While this is happening (remember in less than a second) the projectile is still forcing downwards. As it weakens through shock effects it flattens to form a thin lining to the growing cavity, thereby trapping most of the energy beneath. Eventually the shock waves fill such a volume of the Earth that their energy is dissipated, but locked within the Earth. The final cavity is unstable and much larger than the object that created it. Its flanks fall inwards, and to restore the previous mass distribution the central part may rise under gravity to form the characteristic central peak of many lunar craters (Figure 10.3b). This is not necessarily the end of the work done. A large enough deposition of energy can change the thermal structure of the whole lithosphere to the extent that parts continue to melt in a similar manner to the formation of the lunar mare basalts. Heat could linger for tens, even hundreds of million years, because its only means of loss is by conduction or mechanical means. That is why the lunar mare basalts continued to flow over a 600 Ma period after impacts formed them around 4.1 to 3.8 Ga. There is every reason to suspect similar events on Earth around the same time. Whatever, large impacts modify the internal workings of the planet, and trigger ‘normal’ behaviour to occur prematurely or in one bound rather than several smaller ‘hops’. Earth is unique in possessing oceans, 4 km deep on average and covering 70% of its surface. The 7:3 odds of an alien strike in water poses a special challenge to the impact modeller. Water is too viscous simply to be pushed aside in the one fifth of a second transit time, and models must treat it as a solid. Indeed at the peak shock pressures it would reach the same density as rock. About 20 percent of motion energy enters the sea in a bulb-like volume, to produce temperatures as high as 100 000K. Flash vaporisation of sea water, its dissolved salts and the sediment on the sea floor produces a worrisome chemical fog, dominated by Na, Cl, Ca, Mg, S and many other elements, as well as hydrogen and oxygen from the water. The blast would mainly be upwards, transferring this plasma soup directly to the atmosphere. The simple logic of impacts takes us to the alarming possibility of boiling the oceans away. To boil the estimated 1021 kg of ocean water needs 3 x 1028 J, and only impacts that produce craters larger than 200 km across can deliver this magnitude of energy. Nonetheless, there is a distinct possibility of such a catastrophe in the 4.0 to 3.8 Ga period of truly giant impacts. Mind you, even if that did happen, most of the Earth’s earlier water remained gravitationally bound, and an extra amount may have come if the strikes were by comets. What of the marine equivalents of ejecta curtains? These would take the form of sideways displacement of the oceans’ mass, first driven by the impact, then in the reverse direction by refilling the hole left in the ocean. Because counter splashes (similar to slow motion film of milk drops) would be inevitable, a whole chain of waves or tsunamis would expand outwards (Figure 10.6). As on a beach, when they reached the shallower waters of continental shelves the waves would shorten and steepen, eventually to break. Wave heights of half a kilometre or more would not be an unreasonable expectation for our standard years’-worth-of-sunshine impacts. 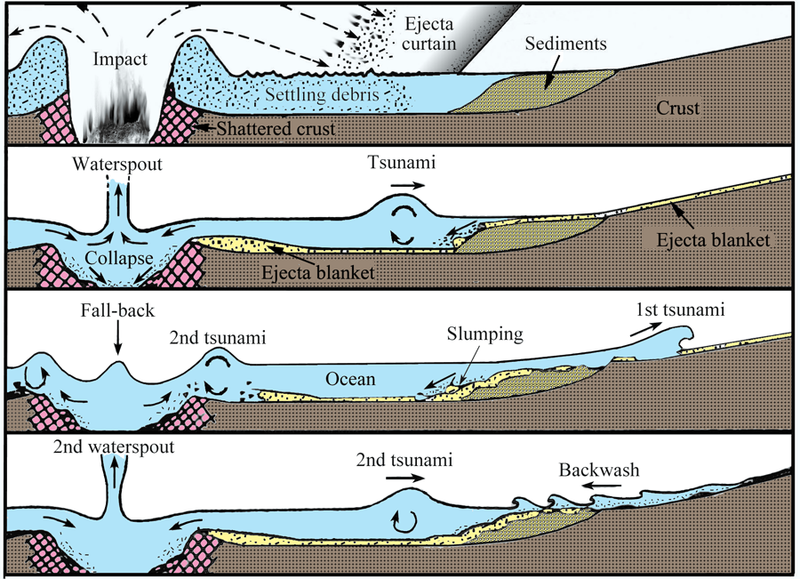 Figure 10.6 Possible sequence of tsunamis following an impact in the ocean. Passage of waves onto the continental shelf cause backwashes to scour the surface and trigger chaotic slumping of sediments at the continental margin. It seems inescapable that the recorded history of the Earth, as well as being one of mundane work done by uninterrupted solar and internal power sources, was occasionally interrupted dramatically. Despite the small size of craters relative to the whole Earth, energy and matter would spread to give global surface effects, yet later erosion and tectonic processes would eventually smooth away proof in the form of craters. Deposition of impact energy adds to that produced by radioactive decay in the mantle, to perform identical work. Eventually it emerges, some by slow conduction but more through the quicker escape route of partial melting and the rise of magma. Such localised heat anomalies and lavas produced there make it well-nigh impossible to distinguish old impact scars from sites of mantle plumes. With only a tiny proportion of the likely impacts on Earth showing preserved features supported by incontrovertible evidence, how much of the known sedimentary and igneous history of the world might have been due to swift and terrible extraterrestrial influences? Several questions arise from the lunar impact record. Why was the greatest battering delayed for half a billion years after formation of the Solar System? We would expect a crowded, young system; chaos out of which an unsteady order emerged. Why has the frequency and size distribution of impacts remained much the same since the great maria-forming bombardment? An initial stocking of errant objects in the Solar System would surely have been thinned out through gravitational ‘cleaning’ by the major planets. What did the projectiles consist of and from where did they come? Considering the last reveals partial answers to the first two questions. Since the Apollo programme more observers have turned to the patient and technically difficult task of spotting small bodies that pass close by and through the Earth’s orbit – near-Earth objects (NEOs). Comets were once much favoured over errant asteroids, partly because some brightly reflect sunlight whereas asteroids are dull, but with new technologies, including radar, the situation has reversed. At present more than fourteen thousand near-Earth asteroids and more than a hundred near-Earth comets are known together with details of their sizes and motions. A number of them would be capable of producing craters larger than 10 km and all move at between 10 and 25 km s-1. Yet, the precision with which their orbits are known allows each NEO to be assessed in terms of the risk of impact that it poses. This precision extends to known objects that are currently orbiting between Mars and Jupiter but will eventually become NEOs through gravitational perturbation. At the time of writing (June 2016) a 2 km wide asteroid ((89959) 2002 NT7) had been observed very closely because of its devastating potential. It had been rated as having a 1 in a million chance of impacting in January 2019, but as more data progressively emerged it is now thought to pose no risk and will pass more than 60 million kilometres from Earth. Another, the 1km (29075) 1950 DA, is rated currently at a 1 to 300 risk of impacting on 16 March 2880. Risks in the short term seem low. Estimates based on a variety of parameters suggest at least 2,000 objects of diameter greater than 1 km that will eventually hit Earth … within the next billion years. By far the greatest risk is from objects on the smaller side of 50 m across that are difficult to detect. Several hundred have been detected from their atmospheric entry flashes (and destruction) over the last 3 decades. Short-period comets (Chapter 2) travel at around 35 km s-1. They come from the Kuiper Belt far beyond the orbit of Neptune and accelerate towards the Sun for longer than asteroids, and so carry more motion energy than do asteroids of the same size. Some 100 SP comets capable of forming 10 km and larger craters can cross the Earth’s orbit. Estimating the number of LP comets that pose this sort of risk is more difficult; by definition they appear without warning. As many as 400 capable of making craters larger than 10 km may cross the Earth’s orbit per year, but that still gives them a vastly greater chance of missing than colliding. Their source is in the remote reaches of the Solar System’s Oort Cloud and their average speed through the Inner Solar System is 55 km s-1. Because of its higher speed an LP comet carries as much energy as an asteroid 10 times more massive. Not all comets show as spectacular objects like Halley’s Comet that cheered-up William Duke of Normandy before the Battle of Hastings in 1066. Many are disappointing, either having lost the volatile ices that generate the bright coma and tail or being made of sticky messes of hydrocarbons. There are dark comets. Small bodies within the Solar System do not have eternally stable orbits, because the gravitational field in the system changes as the distribution of mass fluctuates due the movements of the planets. Even the Earth experiences gravitational change from the Milankovic effect (Chapter 2). The further from the Sun, the less its gravitational field affects motion because of the inverse-square law governing gravity. Smaller objects are jostled this way and that, the smaller they are the more easily gravity perturbs their motion. In the Asteroid Belt the same forces that contribute to the Milankovic effect continually move small asteroids to new orbits. Some leave the Solar System, others move closer to the Sun. The same process perturbs the Kuiper Disk and resupplies SP comets to the inner Solar System. The late heavy bombardment just before the beginning of Earth’s geological record was a storm of very large near-Earth objects. The Moon’s dust and the mare lavas show no unusual chemistries that might suggest collision with huge rocky and metallic asteroids. Icy projectiles would have left little chemical fingerprint and are more likely culprits. On Earth, partial retention of such cometary material would add to the oceans and atmosphere. Some cometary matter is made from carbon-hydrogen-oxygen-nitrogen compounds, an even more intriguing brew. Previously explained by a variety of unsatisfying hypotheses, including galactic gravitational effects, the late heavy bombardment now seems most likely to have stemmed from jostling among the giant planets, long after the Solar System originally accreted from a formless gas-dust cloud in a gravitationally chaotic manner, as outlined in Chapter 9. Once Jupiter and Saturn together with Uranus and Neptune had temporarily stabilised from that maelstrom, it is thought that they slowly accumulated lesser orbital perturbations from an outlying disk of evolving dust and planetesimals throughout the Hadean Eon. Ultimately, around 4.1 Ga, the giant planets shifted out of resonance, pushing Jupiter slightly inwards to its current orbit and thrusting the other 3 further outwards. Incidentally, this may have flung another giant planet from a solar orbit into the void. Over about 300 Ma their orbits restabilised through interaction with the Kuiper belt but at the expense of destabilising the orbits of icy bodies within it. Some fled inwards as a barrage of impactors, possibly to deliver much of the water in Earth’s oceans. By 3.8 Ga the giant planets had settled into their modern orbital set-up; hopefully for the last time. Ominously, however, astronomers have suggested a possible ninth planet (Pluto lost that status in 2006) to explain the deviant orbits of visible objects in the Kuiper belt. Estimated at ten times Earth’s mass, its orbit may be wildly eccentric with a period of around 20 thousand years. Given its size, it might perturb other Kuiper belt objects to send them towards the inner Solar System. Not all the exotic matter encountered by the Earth is in fearsome projectiles. The smaller an object the tinier the gravity shift needed to move it Earthwards, and the more there are to be supplied. The force of the solar wind imposes a lower size limit, as it wafts the smallest particles into interstellar space against gravitational force. A quiet rain of dust falls unchanged on the Earth. Recovered particles include delicate fluffy balls of hydrocarbons from which only the ices have melted away. Rocky planets and various moons all bear some scars of past impacts. Again, the lunar cratering record provides an imprecise but useful key to assessing the age of planetary surfaces and the processes that formed other features on them. From this a framework for broadly reflecting on the Earth is starting to emerge. Density and informed speculation on bulk chemistry suggest aspects shared by all the inner planets. Venus provides the most interesting fuel for debate about long-term Earth processes. Geologists had the scantiest knowledge about its inhospitable surface until orbital radar imaging penetrated its hot, opaque atmosphere. This revealed a cratering record of a surprising sort. Instead of showing a variety of surfaces with different numbers, sizes and spacings of craters, as on the Moon, or very few craters as a result of continuous geological activity, Venus has only one kind of cratered surface. Everywhere is randomly pitted, the craters are more widely spaced than on the lunar maria, and none is bigger than 250 km across. Apart from a tailing off for small craters, their numbers obey the general inverse proportionality to the square of diameter shown by Figure 10.5. Venus shows no sign of intense heavy bombardment, which implies that, like the Earth, Venus has a missing early history. Yet, judged against the yardstick of the lunar maria record, that of Venus reveals a geological history that is far shorter than the Earth’s. The best estimate puts it at only 500 million years. Venus has been very active geologically. There are great volcanoes and linear zones of crumpling under lateral stresses. But craters pepper these obvious signs of activity just as much as they do the less modified parts. All the signs are that Venus’s entire surface formed from outpouring lavas. The crater record strongly hints at a single, massive volcanic ‘repaving’ half a billion years ago. Then ‘geology’ just stopped, except for a trickle of lava no more than that emitted by Hawaii. This resurfacing is far too young to reflect mare-like giant impacts on an otherwise inert planet. A more likely explanation is that Venus stores internal energy deep inside, only periodically relieving itself by a powerful belch that transfers deep-melted magma to coat the surface. We have seen evidence in Part II from continental flood basalts and those of oceanic plateaus that such periodic resurfacing events have occurred in Earth’s history, on a much smaller scale. Maybe Venus’ exhalations are an extreme case of one of many general laws of the behaviour of rocky planets.